The first OnePlus smartphone in 18: 9 format benefits from the strength of its predecessor and competes with the most expensive devices. In the absence of suspense, the OnePlus press conference was marked by enthusiasm. For the first time, the manufacturer launched a smartphone equipped with an “edge-to-edge” screen, in 18: 9 format. This aligns well that offer Samsung , LG , Huawei and obviously Apple with its iPhone X . But unlike these big names, OnePlus does not push up its prices. Like the OnePlus 5 , the OnePlus 5T is launched at 499 euros in 64 GB version (6 GB RAM) and 559 euros in 128 GB version (8 GB RAM). Aesthetically, the evolution is much more important than that which separated the OnePlus 3T from OnePlus 3 last year. The case size of the OnePlus 5T is close to that of the OnePlus 5, but the diagonal of its screen goes from 5.5 inches to 6 inches. The horizontal black bands are trimmed, for a grip rigorously identical. Eyes closed, we would have a hard time distinguishing the two devices. The consequence of the integration of a screen in 18: 9 format is the removal of the physical button and therefore the fingerprint sensor. The first is replaced by a virtual button, the second is relegated to the back of the smartphone. Unlike the Samsung Galaxy S8 photo module found in the middle of the hull, the OnePlus 5T\’s dual module is placed in the upper left corner. OnePlus was therefore free to center its fingerprint sensor at a good height. It falls perfectly under the index. Same brightness as the OnePlus 5? 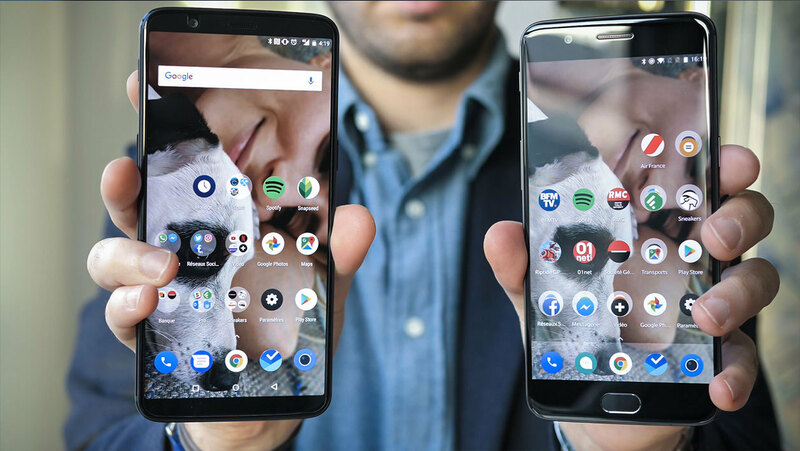 Like many colleagues, we noted a strong resemblance between the OnePlus 5 and the iPhone 7 Plus . The OnePlus 5T is closer to the California smartphone. The slab now rising to the height of the double photo module, it is found “pushed” outward, with a larger protuberance. To soften it, OnePlus has created a small metal notch to frame the element, as Apple does from the iPhone 7 . It\’s not original, but it\’s successful. The display quality seems to change little, with the use of a full HD OLED screen (402 dpi). Comparing the OnePlus 5T to a OnePlus 5, we did not notice a difference in brightness. The model released at the beginning of the summer amounting to about 450 cd / m², the readability outside should therefore be satisfactory. The figure is, however, behind the best OLED screens on the market, starting with the Samsung Galaxy S8 which climbs to 550 cd / m². 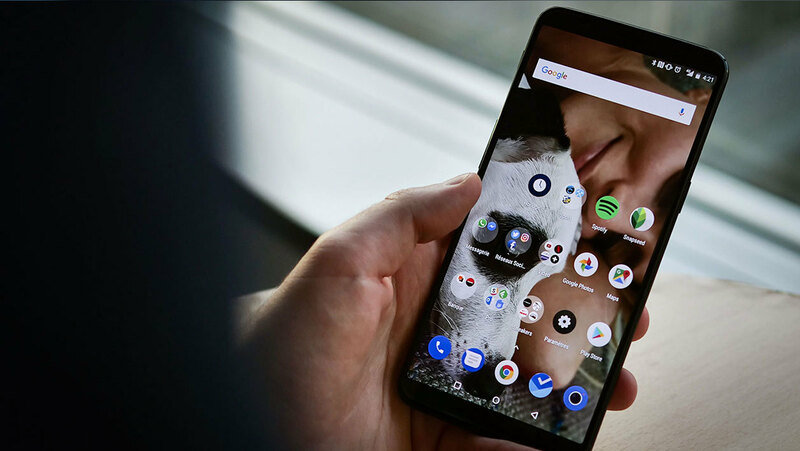 The release of the OnePlus 5T is an opportunity for the brand to introduce Advanced Facial Recognition, its facial recognition system. It can be used alone or in addition to fingerprint recognition. We were able to configure it to test its effectiveness. After a rather brief recording of our features – about five seconds, the OnePlus 5T unlocks when we tilt it in front of our face. At least, that\’s what we deduced from it, so fast is the operation. After a brief check by placing the smartphone in front of a colleague – he refuses to unlock, we confirmed that the OnePlus 5T went through the box “facial recognition” before lighting. We also took the time to place a picture of us – printed, then on a screen – in front of the smartphone, which did not let itself be trapped. The minimum level of security therefore seems assured. Of the ten tests performed, the device was unlocked each time in a flash. Simply bluffing. This OnePlus 5T will not shine by its new software. 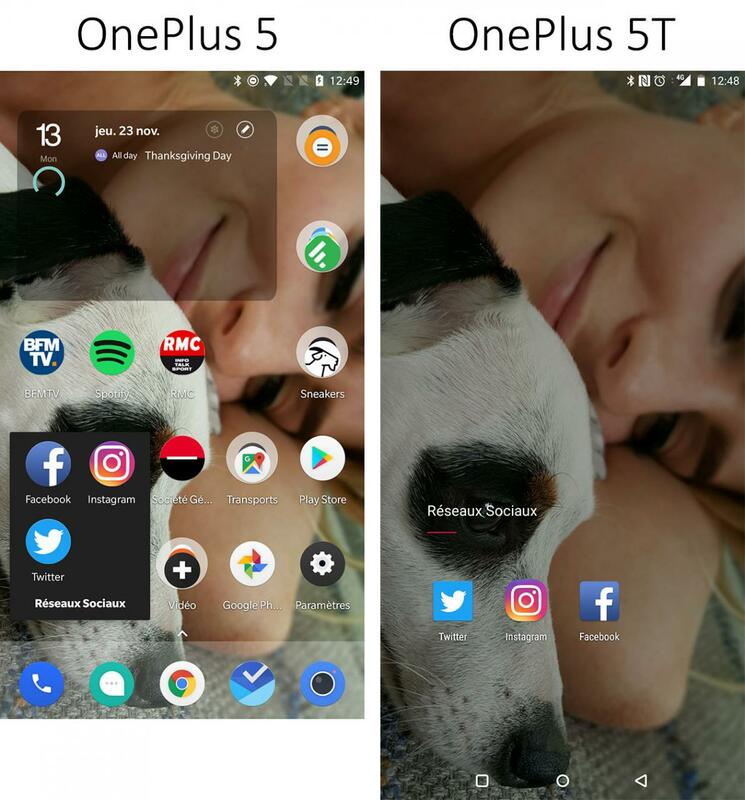 Under OxygenOS 4.7, new shortcuts are appearing, such as the ability to take a picture by long press on the fingerprint sensor. OnePlus offers some new design elements. The folders present on the home screen do not appear as a simple superimposed window, but as a new page marked with a thin red line. Note that we did not suffer a “jelly effect” during navigation, which suggests that OnePlus was able to get rid of this slight image distortion at the time of vertical scrolling. 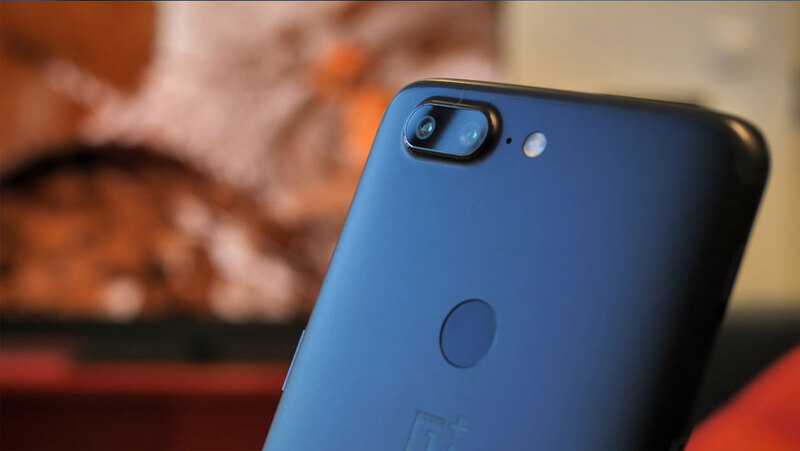 At first glance, the OnePlus 5T\’s dual photo module resembles that of the OnePlus 5. Yet, the brand\’s engineers have completely reworked their offer. Exit the secondary lens with focal length of 38 mm dedicated to portrait mode. The one that made the OnePlus 5 a direct competitor of the iPhone 7 Plus or iPhone 8 Plus and iPhone X. It is replaced by a 20 Mpix sensor with a focal length of 27 mm, as the main sensor (16 Mpix ). The OnePlus 5T therefore embeds two objectives of the same focal length, opening both f / 1.7 and with pixels of 1.12um for the first and 1 um for the second. At first glance, their complementarity is not obvious. It is also the second module – with the smallest pixels – which is responsible for taking pictures in difficult light conditions. The company says its secondary sensor “fuses” four pixels into one to reduce noise in low light. An affirmation difficult to verify when we take control. However, we were able to take some shots, with a dive that seems superior to that of OnePlus 5. The speed of shooting also seems to be progressing. It is therefore to be hoped that the strategic choice of the brand will pay off as it implies the removal of a focus dedicated to the portrait mode. The function does not disappear, but is now limited to applying a background blur on images produced by the main sensor (wide angle). 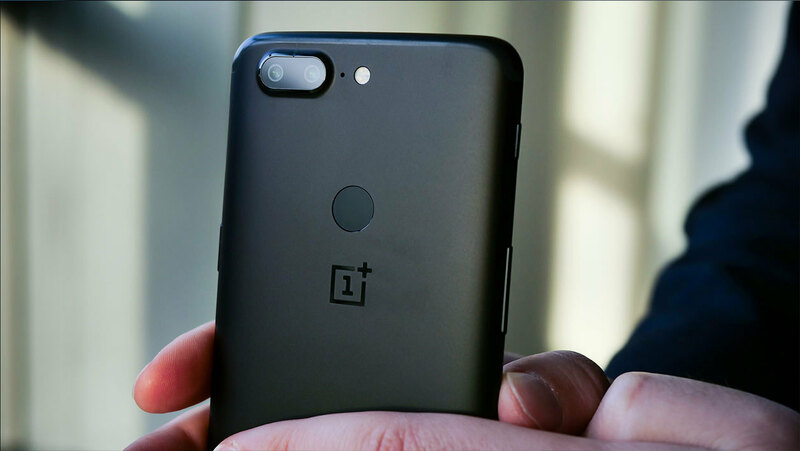 Equipped with Snapdragon 835 associated with 6 or 8 GB of RAM, the OnePlus 5T should not experience power problems or responsiveness. Like its predecessor, it displays only a Full HD definition, which allows it to gain even more fluidity. It is therefore unlikely to disappoint in this area. However, the screen change could have a significant impact on the autonomy of the terminal, which still has a battery of 3300 mAh. 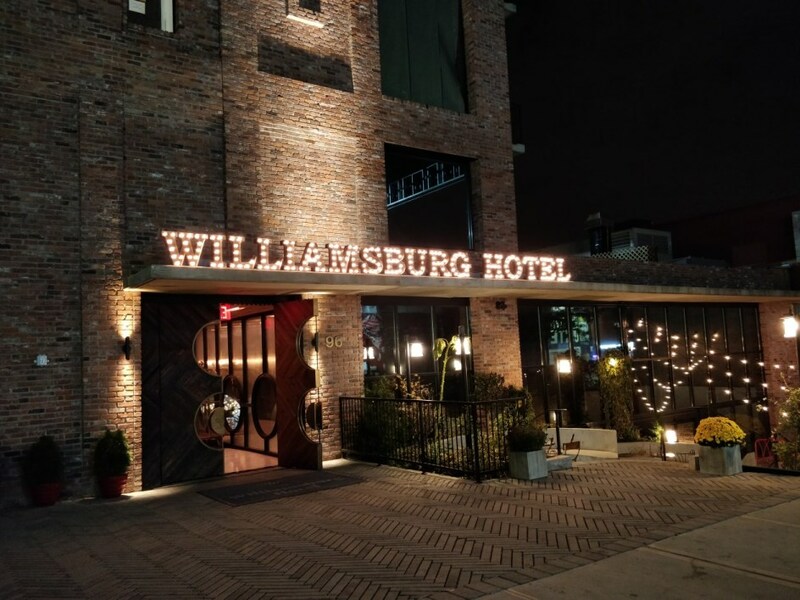 If the OnePlus 5T has the same endurance as the OnePlus 5 and a better photo quality in low light, it could assert itself as one of the best smartphones this end of the year.